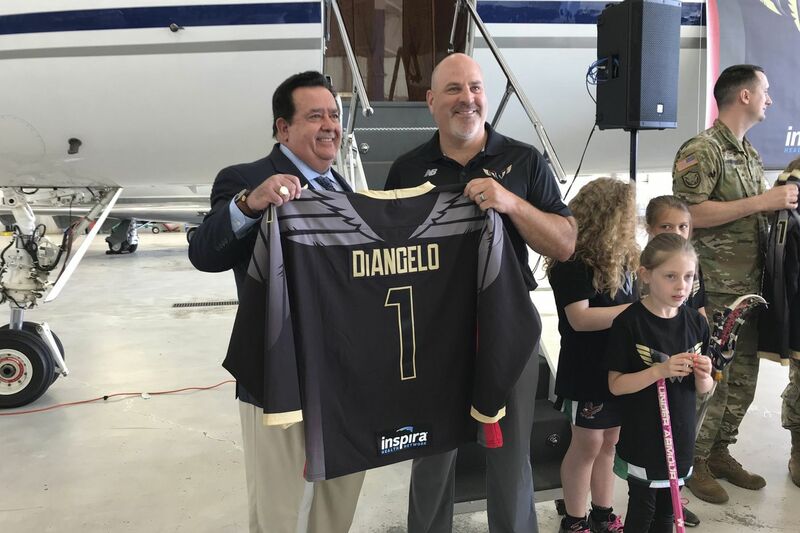 Inspira Health Network CEO John DiAngelo (left) and Wings head coach/general manager Paul Day (right) pose during the unveiling of the Philadelphia Wings home jerseys on Tuesday. The Philadelphia Wings lacrosse team — playing in its inaugural season, under a name used by the city's former franchise — unveiled its home jerseys for the coming season on Tuesday. Black with dark gray "wings" on the shoulders, the jerseys feature the Wings' beige, gray and red logo on the front and black numbers with beige piping and beige letters on the back. The Wings play in the National Lacrosse League, an indoor lacrosse (also known as box lacrosse) league with nine teams scattered across the United States and Canada, and two — Philly and San Diego — set to begin play this winter. If "Philadelphia Wings" sounds familiar, that's because it is: From 1986 to 2014, an NLL team called the Wings played at the Wells Fargo Center. Before that, from 1974-75, the Philly Wings played in the Eagle Box Lacrosse League. In 2014, the NLL franchise moved to Connecticut, where it was renamed the New England Black Wolves. In September, Comcast Spectacor announced it was starting an NLL expansion franchise. In late November, the name — chosen through an online vote — was announced. The NLL is based in Conshohocken.